Sometimes a ride hits you in a Homer Simpson donut way – there are no words, just “Ahgggh.” Or, in the case of the QX70, I just kept thinking, “Damn, this is a nice (expletive) car.” It’s tough to be surprised when you’ve tested over 800 cars and trucks, but when I sat down behind the wheel and was enveloped by the smell of sweet aromatic leather (standard), placed fingers on a cockpit festooned with wood, brushed aluminum and fine materials, saw the twinkling center console seeming to smile back at me, it was love at first drive. You can’t ask any more of a car. 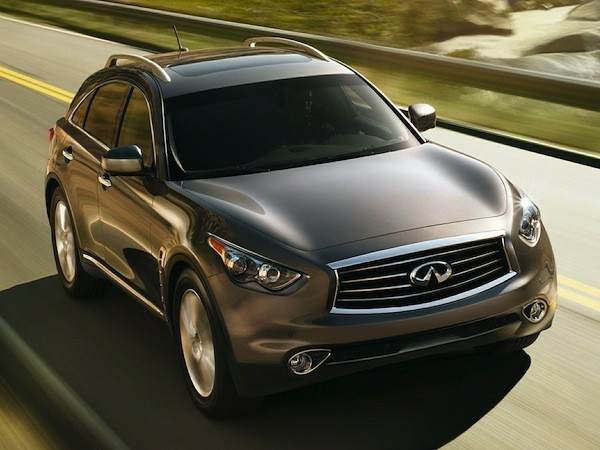 So what makes the QX70 top in its class? It’s got a healthy, kickin’ engine, first – a 325-hp 3.7-liter V6 equipped with technology called “Variable Valve Event and Lift” (VVEL) that helps the power plant breathe freely for instant acceleration and enhanced efficiency; no wonder I thought it was a V-8. (There was a V-8 available, but it’s been discontinued.) Behind the car, the combined dual intake and exhaust creates a blorty-snorty note you can feel as well as hear. It also handles the road like a sportster, putting up with a thrashing at high (ish) speeds and holding steady. Some fear flipping over in a bigger ride, but this one didn’t leave the ground even when I dared it, a little.